Description of "Door To Door"
Door To Door is a breezy and exciting caper, set against the backdrop of the Transport businesses in India. The author has chosen a fresh, visual and innovative style of presentation. Similar to a Movie/ Play or Theatrical Script, it is written in a form that any Script or Playwriting enthusiast would love to read! 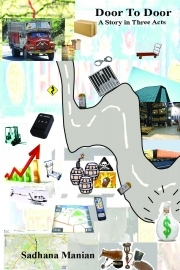 The story abounds with amusing caricatures of confused customers, daredevil Truckers, ruthless businessmen and other characters from the Transport and Corporate world. Read it for an original, unpredictable story that takes you through a breakneck joy ride! Sadhana Manian is an Author and brilliant Script writer, who has written innumerable Scripts for Plays and Performing Arts Events since her college days in Mumbai. The author also shares valuable insights in this book on the art of Storytelling and Scriptwriting. Madhyamavyayoga - The Story of the Middle Son by Yadugiri V. T.
Reviews of "Door To Door"
Finished in one train ride - this is a real fun script of bad guys/good girl/good girl gets bad guys/good girl gets bad guys to get the good guy etc...many missed connections. The script is colourful and jumps from Mumbai to Jaipur, as Anita inherits an antiques which she ships to her MUmbai home. Unlucky enough to use a shoddy transporter GTH, the package is lost. The story then is that of Anita haunting the transporter, through hook or by crook (mostly the latter), while exploring the seamy side of Delhi business circles with rivalries in the transport business, unscrupulous family dealings, babus and cops and finally...she does get her packagae. The story is also a first class primer on script writing and screenplay writing and the author takes pian to teach and instruct --> I am now dying to see it made into a tight Aamir Khan film, starring Preity Zinta as Anita, and the various Jha's and Kumars as the transporters. Door to Door is a very interesting take on the Indian industry today. It does bring out some problems e.g. poor customer service, etc. But it also shows the potentially bright and exciting side to Indian businesses, the triumphs and tribulations of running a business in India, and winning! It also provides good instructional material for Script Writing. Written in a true Bollywood style, I'd be happy to see this book made into a movie one day. Brilliant effort by Ms. Manian.